Juju is a state-of-the-art, open source modelling tool for operating software in the cloud. Juju allows you to deploy, configure, manage, maintain, and scale cloud applications quickly and efficiently on public clouds, as well as on physical servers, OpenStack, and containers. You can use Juju from the command line or through its beautiful GUI. In modern environments, applications are rarely deployed in isolation. Even simple applications may require several other applications in order to function - like a database and a web server for example. For modeling a more complex system, e.g. OpenStack, many more applications need to be installed, configured and connected to each other. Juju's application modelling provides tools to express the intent of how to deploy such applications and to subsequently scale and manage them. At the lowest level, traditional configuration management tools like Chef and Puppet, or even general scripting languages such as Python or bash, automate the configuration of machines to a particular specification. With Juju, you create a model of the relationships between applications that make up your solution and you have a mapping of the parts of that model to machines. Juju then applies the necessary configuration management scripts to each machine in the model. Application-specific knowledge such as dependencies, scale-out practices, operational events like backups and updates, and integration options with other pieces of software are encapsulated in Juju's 'charms'. This knowledge can then be shared between team members, reused everywhere from laptops to virtual machines and cloud, and shared with other organisations. The charm defines everything you all collaboratively know about deploying that particular application brilliantly. All you have to do is use any available charm (or write your own), and the corresponding application will be deployed in seconds, on any cloud or server or virtual machine. Can I use Juju with Puppet or Chef or Ansible? Yes! Puppet, Chef, and Ansible are great tools for writing configuration files. Juju works a layer above that by focusing on the long term operations required to keep that software running over time, regardless of the machine on which it runs. So the Juju charm for an application includes (amongst other things) all the logic for writing configuration files for that application - that logic itself can be written in whatever language or tool the author of the charm prefers. It is common for people to start creating a charm by bringing together Puppet or Chef or other scripts which they currently use to automate the writing of the necessary configuration files. If the charm is going to be writing and updating configuration for the application, and there are already tools to abstract that configuration file nicely in your preferred language, then use that in the charm! Even better, two different charms from different teams that use different tools will still happily work together to deploy a solution. In a large organisation, it is common for different teams choose different tools; Juju allows teams to pick whatever works for them and their expertise in their application, but still reuse whatever they want from other teams. Different charms can use entirely different configuration management tools. The main change in moving configuration management scripts into a charm is that one wants to focus only on a single application for each charm. If your application is made up of many independent services, you will want to split out each logical application into a different charm to increase the quality and re-use of that charm. 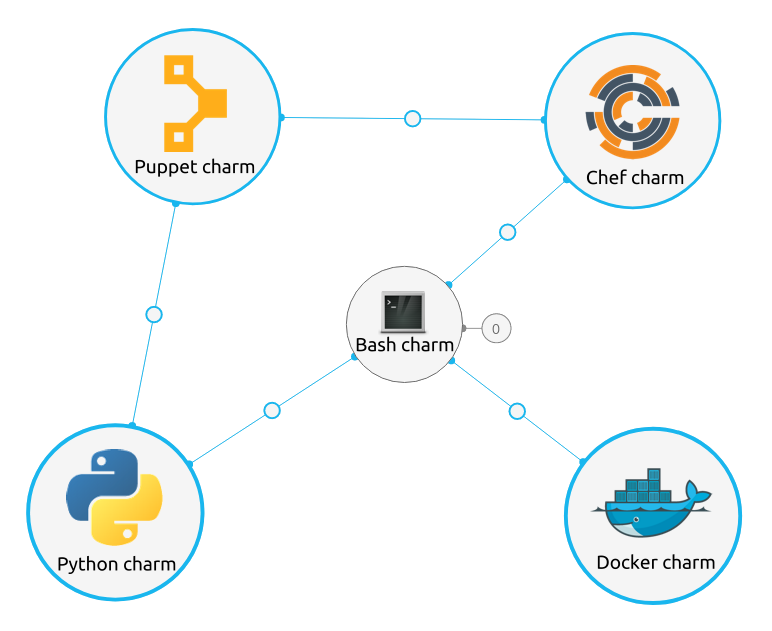 Yes, Docker is a popular delivery mechanism and you can create Juju charms that use Docker to run your application. The choice of internal tooling is entirely up to the author of the charm. If Docker is the easiest way to fetch and run the application you are charming, then go ahead and use that. Juju is about connecting different applications - from different teams, in a way that is independent of the particular choices that were best for those teams, and which can be reused by different organisations on different clouds. The goal of Juju is the reuse of common operational code in widely different environments. For example, you want to have a single operational codebase that drives your database install, whether the particular deployment is for test or development, whether it is in the cloud or on a virtual machine cluster. You also want to use the same database operational code when that database is being deployed as part of wildly different application models. Sometimes you will be monitoring the database with Nagios, sometimes with Boundary, sometimes with Tivoli. For this reason, the same charm contains operational code for all of the possible things one might want to do. When a user links the database service up to the Nagios service, an event is triggered which executes the necessary integration steps automatically. Taking an event-driven approach allows the charms to respond dynamically to the particular needs of a particular deployment. That makes them more widely useful, more likely to be reused, and ultimately of better quality. A bundle is a collection of charms and their relationships, designed to give you an entire working deployment in one easy to use collection. Modern applications are typically composed of many applications - databases, front-ends, big data stores, logging systems, key value stores… service-oriented architecture has become the norm. Each application will be defined by a single charm. To describe the whole application you need to describe the set of charms and their relationships - what is connected to what - and we use a bundle for that. For instance, a content-management system bundle could specify a database and a content management server, together with key-value stores and front-end load-balancing systems. Each of those applications are described by a charm; the bundle describes the set of charms, their configuration, and the relationships between them. This allows teams to share not only the core primitive for each application, but also enables sharing higher-level models of several applications. It allows you to replicate complex application models in a cloud just by dropping the same bundle onto your Juju GUI. Bundles can also be deployed in-memory, which allows your developers to spin up workloads on their laptops to simulate an environment similar to a real production deployment. Bundles can be shared publicly or privately. New bundles are added to the public collection every week. And you can now bootstrap Juju, launch the GUI and deploy a bundle with a single command. That means you can go from zero to a full cloud deployment in seconds with the right bundle. What about Windows or other Linux operating systems? Yes, charms can be written to deploy Windows applications. And those can be deployed right alongside Linux applications (albeit in different machines!) in the same large-scale application model. If you need to integrate Active Directory on Windows with Hadoop on Linux, this is the way to do it. The Juju client can run on Linux, Windows, or macOS. And of course, once you have the Juju GUI up, all you need is a web browser to manage your environment and deploy more software, or scale up your existing applications. Can I use Juju to move applications across clouds? You can use Juju to recreate application architectures on a wide number of clouds and platforms. In other words, if you have deployed a set of applications on one cloud, you can recreate all the same applications with the same relationships and the same configuration, on any other cloud or “substrate” that Juju supports. If you are migrating from cloud to cloud, this solves at least part of your problem, which is the operational lock-in to that cloud. However, you will still need to copy the data across from cloud to cloud manually. What language are charms written in? Charms can be written in any language or configuration management scripting system. Chef and Puppet are common, more complex charms tend to use Python. Charms have been written in Ruby, PHP, and many charms are a collection of simple bash scripts. Your choice of language would be influenced first by what’s already been done - if there is an existing charm for the application you need and you just want to add a feature, it’s probably best to contribute to that existing charm. Also, if there is not yet a reasonable charm for your application, but you have existing scripts yourself - for Puppet or Chef, or in Bash or Python - then use those as the starting point of your new charm. A charm is also a collection of scripts that handle different kinds of events. Those scripts do not all have to be in the same language. If there is an existing charm, mostly in Ruby, but it does not handle a connection to your favourite monitoring system, you could add the scripts that provide the integration you need in the language of your choice. What charms are currently available? Are charms open source? Under what license? Charms can be released under whatever license the author prefers, there are charms under just about every kind of license out there today. In many cases, charms follow the license of the applications that they deploy, but this is not a requirement. There are open source charms that deploy proprietary software, for example, and the reverse would be possible as well. Juju itself imposes no requirements on the license of the charm. Check out the details in the charm store. We do encourage the charming community to keep their charms open source in order to stimulate the sharing of best practices and better code, and most charmers have followed that guidance, picking a license that works for them. Can I write my own charms? How? Absolutely. A charm is just a collection of scripts and metadata. You can get started quickly by copying existing charms - respecting their license if they are copyleft! Use the language of your choice. It’s normal to get something quick-and-dirty working in bash, then switch to a more sophisticated language as the charm takes shape or becomes more complex. Charms are code - operational code - so you want to think of them that way. Use revision control from the start, collaborate with colleagues, and consider including test suites so you can automate quality control for deployments very easily. There are extra Juju charm tools to make it easier to test charms, and templates that get you started quickly. If you want, you can also share your charm with the world and gain feedback and contributions from others! In our experience, the more widely a charm is used the more useful it becomes. Different teams bring different expertise - security, performance, scale, and all of those things make for improvements in the charm that are very hard for a single team to achieve. What are the best workloads to try with Juju? Juju excels with scale-out workloads like big data, PAAS, cloud infrastructure such as OpenStack, or container management systems. Pick your favourite cloud and launch a Juju server. From the integrated GUI, you can drop one of the bundles from the charm store into the blank canvas. Spin up a multi-service PAAS on whichever cloud you like! Deploy your own private cloud on bare metal servers. If you want to evaluate OpenStack, you can use Juju to spin it up on VMware too. How does Juju use containers? And if any of those charms use Docker then you would have Docker running the app inside an LXC system container! For extremely dense deployment on clouds or on laptops, containers offer much greater utilisation of the system capacity than traditional virtual machines. Where can I get enterprise-grade support for Juju and charms? Canonical, the company behind Ubuntu, provides commercial professional support for Juju.